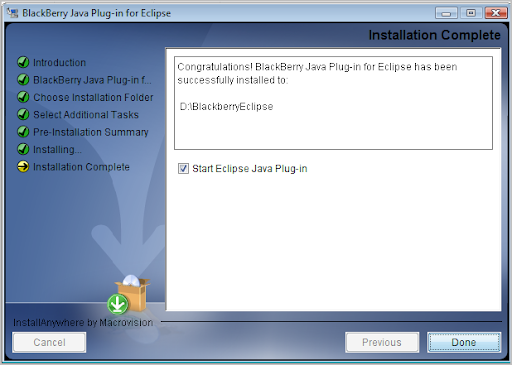 Get Started Developing for BlackBerry. 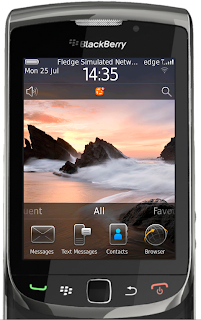 Are you looking for BlackBerry application development tutorial. 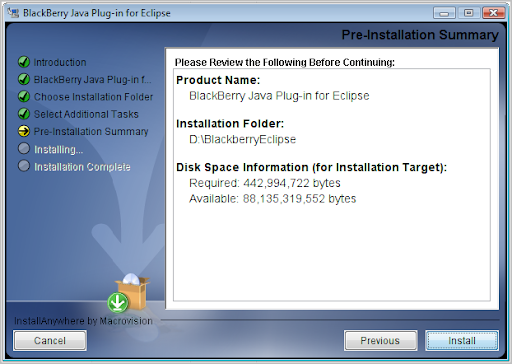 Take a quick look at this post my friend want to explain how to download and install BlackBerry standard development kit with eclipse IDE. It's very simple just follow these steps and you can create Hello World program. 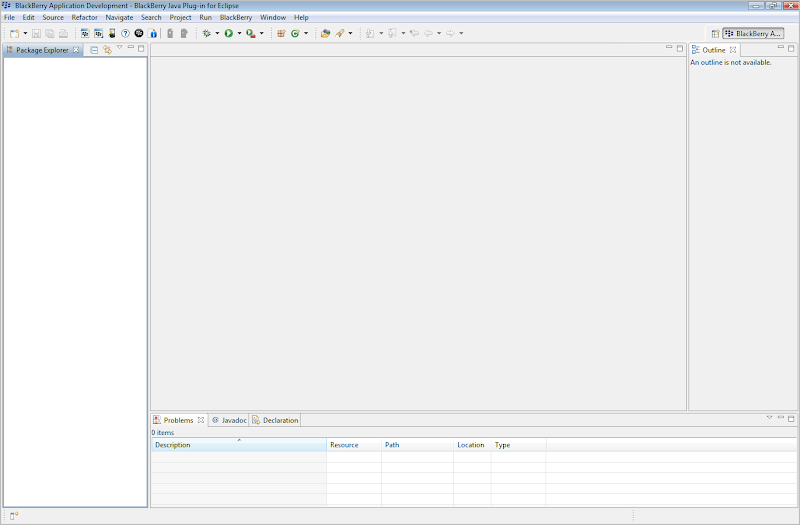 I had used a specific format for reporting and tracking bugs which you can see in the spread sheet (excel) below. Tested the following URL (labs.9lessons.info) and reported issues to Srinivas Tamada (developer). 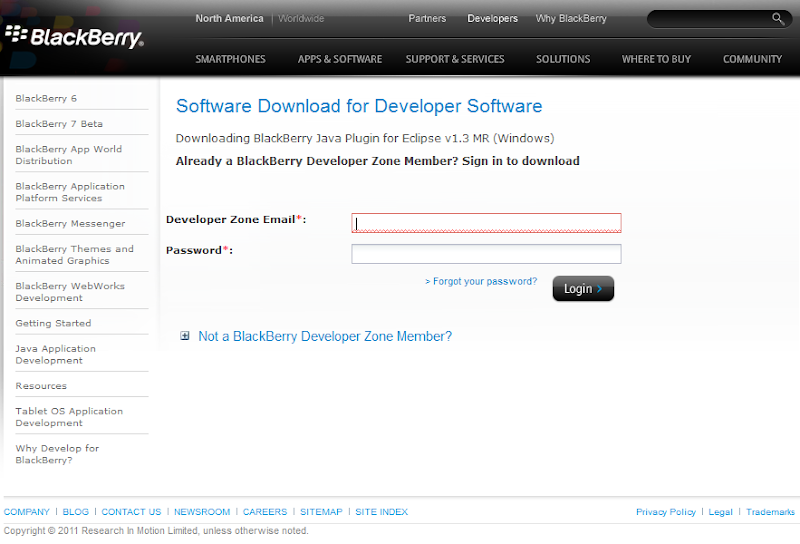 Click here to the site where you can download the Blackberry 7 SDK and click on the highlighted link to download the file. The previous page will navigate you to a login screen where you can enter your credentials and login (If you don’t have one, register for a new one). After login, you will be redirected to download page and click download button. Double click on the downloaded file to install it. Chose accept and click next. Chose the destination place where you want to install the eclipse and click next. If you do not want to create shortcut on desktop and programs means uncheck those check boxes and click next. 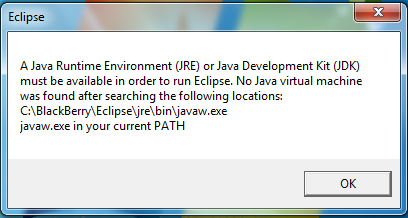 If you get this error message means you have to download the latest version of JRE and install and run the eclipse. 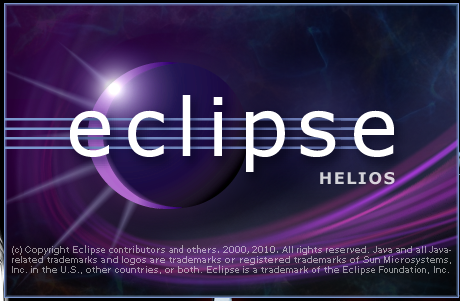 Your eclipse will start like this. Chose the destination folder for your workspace and click the check box to avoid this message on future use. Your eclipse will opens like this. Enter your project name and click Finish. 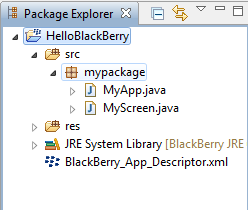 In you package explorer you can find “mypackage” under your project source which contains two class files named “MyApp.java” and “MyScreen.java”. Here “MyApp.java” is your main application class and “MyScreen.java” is your application screen class. 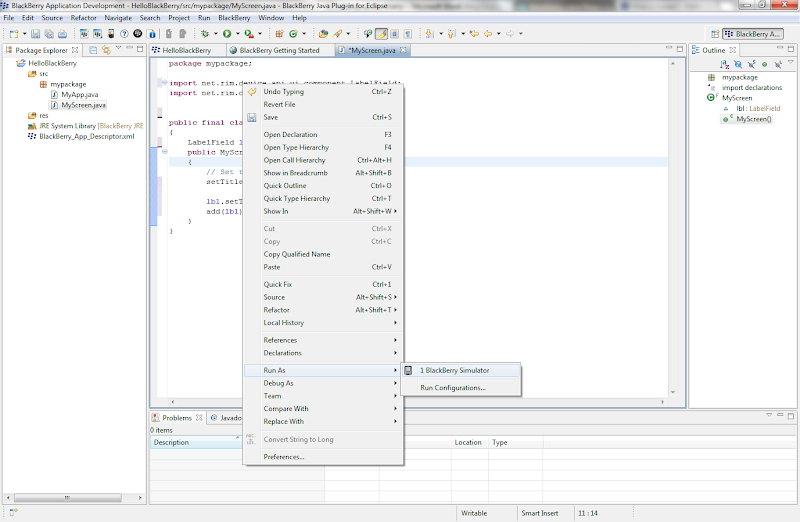 Double click on the “MyScreen.java” and replace the following code in it. 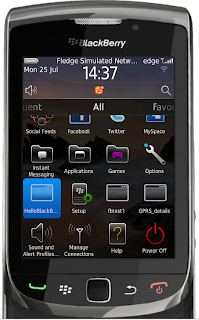 Here I have added a label field and assigned the text as “Hello Blackberry”. I have changed the screen title as “My First Application”. Your blackberry simulator will open like this. 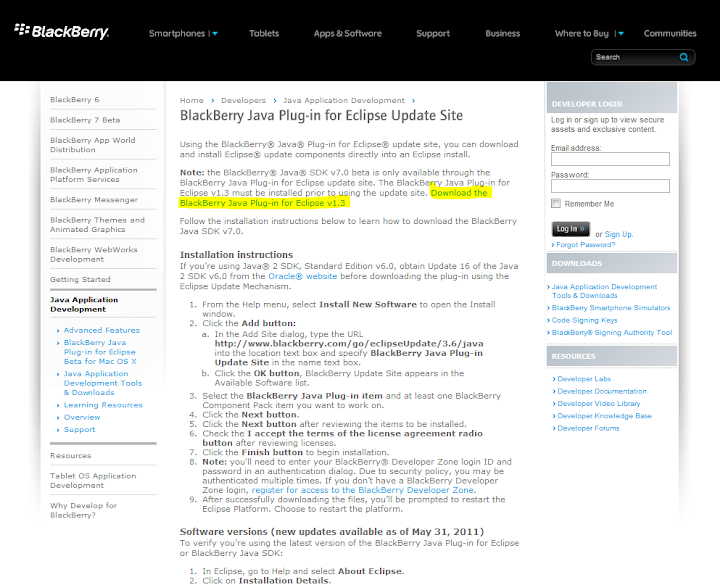 Here click “All” and swipe or scroll down to your “HelloBlackBerry” application and click on it to open. 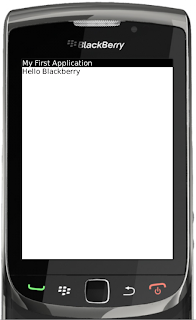 You can see the “Hello Blackberry” on the screen and the “My First Application” on the title. 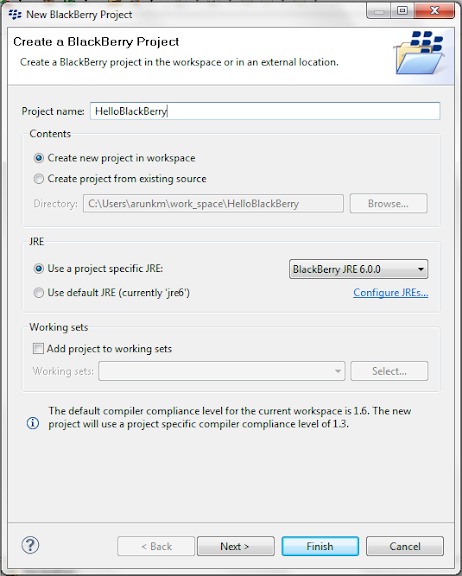 You can import blackberry sample projects by File -> Import -> BlackBerry -> ”Import BlackBerry Samples” and click Next. Then click Finish. 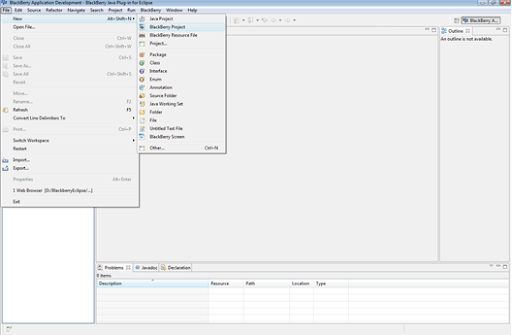 You can find the sample projects in your project explorer. Can I translate your tutorials in russian and post it in my blog? Hey Awesome da! Arun...you've started rocking! This is a neatly presented.Keep up the good work da! 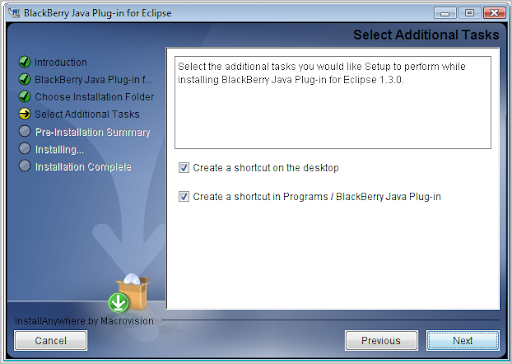 I can only use Eclipse? What about Neatbeans? Nice one. Thanks. can you start a lesson for android applications also ? @all: once again thanks to all..
@Anonymous : Hi.. I can't able to get your question. 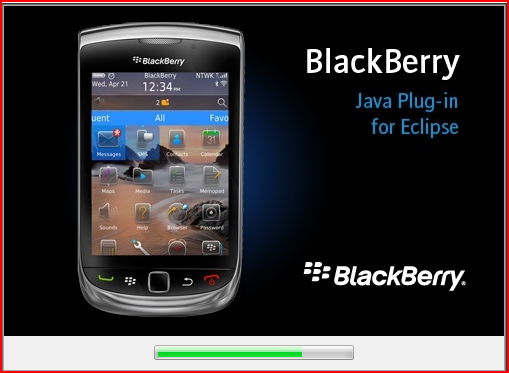 You want to develop Blackberry or I Phone applications ?? @ Anonymous: I have planned to post same installation process for Android, Windows Phone 7, Blackberry PlayBook etc.. in my blog soon. After that i will start lessons for Android application too.. Thanks... Good article. Please publish more tutorials if you can. Thanks been searching for good stuff like this. 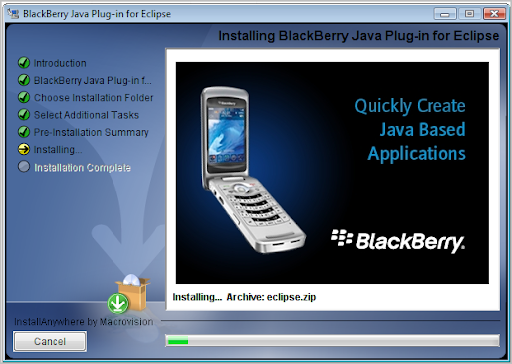 Downloading Blackberry SDK, and thanks for this clear tutorial..
have you posted other tutorials about BlacBerry? if yes, where I can see it? very nice post for beginners!!! It's although same in android app development. Difference would be about Software Development Kit and simulator as they have. Anyway that was informative. Thank YOu Very Much Arun...Pls keep posting.....!!!!!! I bookmarked this page. and waiting for next update like this one..!!!!!! 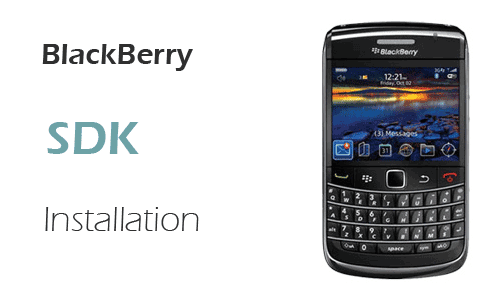 "BlackBerry App World is having trouble connecting to the BlackBerry App World Server.Verify your network connections and try again". very neat and clean sample example given by arun. thnks to Help . Simply superb example given in this post. 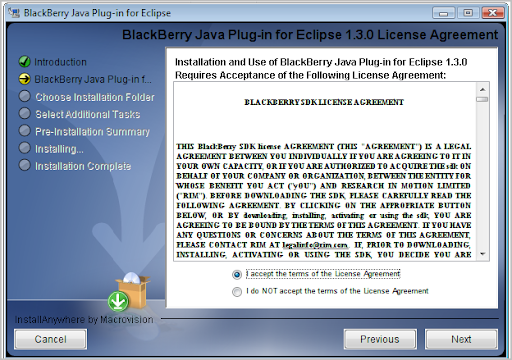 Really it's very helpful to blackberry developer to develop their first app. Thank you very much for such a great post. 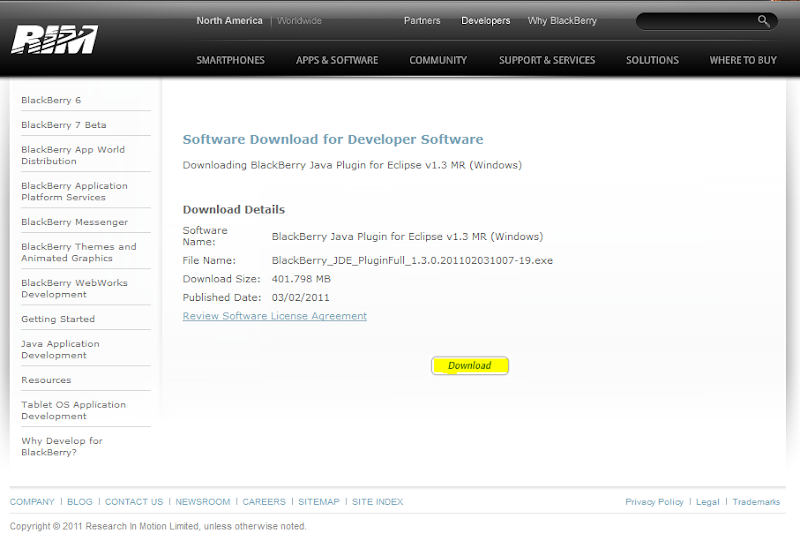 Thanks for sharing a blackberry SDK download and installation process, given the easy download and install process. This is a wonderful information. 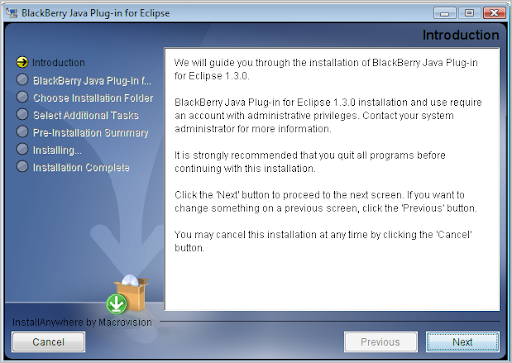 This is a very nice tip's to download and install the Blackberry application. Thanks for share Cool information.